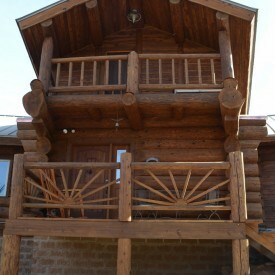 When you think about the best in the log home care business, you should think of 888-LOG-GUYS! Our knowledgeable staff is ready to help you find the best solution for your log home restoration, log home repair, log home chinking or caulking, log home improvement, and log home maintenance in the Union City Tennessee area. And our professional crew will deliver a service guaranteed to completely satisfy you. To us, the job is not complete until you are 100% satisfied. Call us today, or ask for a free estimate from our website! If your log home is looking dark, gray, or weathered or if your stain is peeling, you may need to have 888-LOG-GUYS come to you for a log home restoration! Our crew is very experienced in media blasting (corn cob, glass, walnut, and sand blasting), sanding, cleaning with a borate treatment, chinking and caulking, and using the best product of stain to make your home look incredible! Contact us by phone or use our estimate request from our website to find out how we can make your home look as good as new! There is no project that will intimidate us! Even severe log rot won’t keep us from trying to bring it back to excellent condition. Our crew has repaired or replaced many feet of log due to severe damage from rot, bugs, insects, and birds. 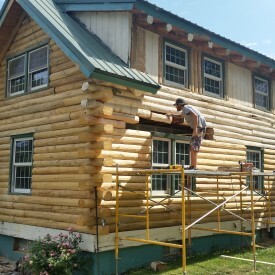 We have even replaced whole walls to save log homes from disaster. 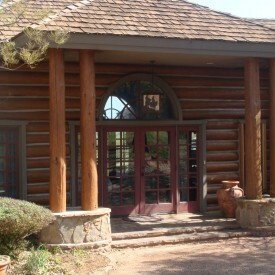 We want to fix your log home problems so that you do not stress about your log home. We are ready to serve you in the Union City TN area, so call us on the phone, or ask us for a quote online! Have you experienced invading insects and bugs in your log home? Have you felt an air draft around your doors or windows? Have you noticed water leaks coming through your walls? 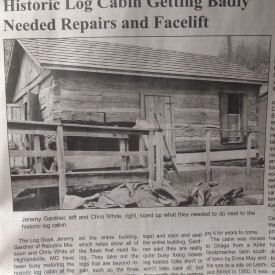 If you have had any of these problems, then consider asking 888-LOG-GUYS to solve your problem with an energy seal (chinking or caulking) on your log home or log cabin. It will seal the gaps in between your logs and prevent bugs, water, or air drafts from entering your log home. Let us make your log home comfortable again! Call us today! 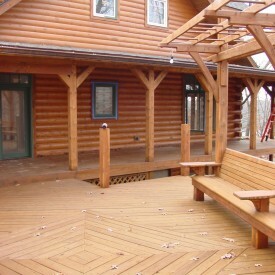 We specialize in log staircase construction and log railing construction, in building decks, porches, and patios. If you are interested in these additions to your log home or would like something else built to increase your log home’s value, call 888-LOG-GUYS to discuss your options and how to make your ideas become real. Our crew has the carpentry skills to construct any additions to beautify your home. A log home requires lots of tender loving care, and 888-LOG-GUYS are the guys to maintain your log home. 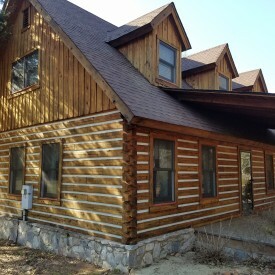 We have the skills in preserving your log home or log cabin in the Union City Tennessee area. Our company is always loyal to you and the upkeep of your home. 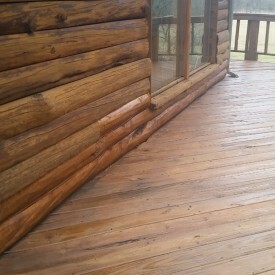 You will save time and save money having us clean your log home every few years, keeping it in excellent condition. And if the unexpected happens, we will be there to fix your log home problem. We are dedicated to an open relationship with our clients based on trust, and you can trust us to always be there. Call us for a quote or ask for one from our website!